On 25th February, Samsung is officially announcing its much-awaited Galaxy S9 and S9+ smartphones which have leaked numerous time before. Just yesterday, we got all the official press renders of both phones along with the full spec sheet. There were already reports of a 256GB ROM variant of the Samsung Galaxy S9+ and looks like we are getting one. The Korean Phone Lost and Found Center is an authority where the lost and found phones are reported. The latest list of the smartphones includes the Samsung Galaxy S9+ (SM_G965N_256GP), and as highlighted in the image above, it seems this one has an impressive 256GB internal storage. 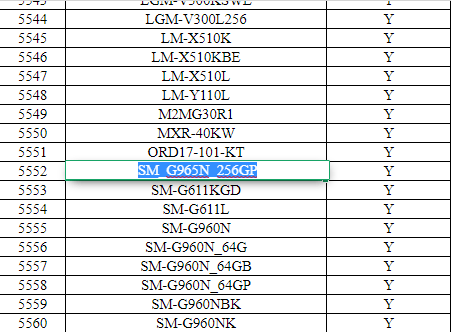 And hey, did you notice the Galaxy S9 with model number SM-G960N on the list? Yes, the one listed is the 64GB ROM variant, and we are sure that there aren’t any variants of the regular Galaxy S9 with more ROM. Samsung is sticking with the same 4GB + 64GB combination as seen last year with the Galaxy S8. Well, if there is a variant with 256GB ROM, then the storage is not going to be an issue for sure since there is also an option to add a microSD card up to 400GB. Would you like to see the Samsung Galaxy S9+ with 256GB ROM? Do let us know via the comments section. I am so ready to buy the S9+ but Im wanting to get it with the 256 memory. How can I get one? It looks like places over seas from the USA has them and I WANT one.